I've learned my lesson when it comes to ignoring games just because they don't have the realistic graphics that are commonly seen nowadays. I say this mainly because the beauty of a game doesn't necessarily have to be limited to how much John Doe looks like an actual human being. 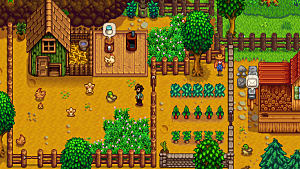 I've long since put away my pride and taken a gander at Stardew Valley, an indie farming sim by ConcernedApe that leaves you without the sweat and regret that's often a result of the actual farm life. 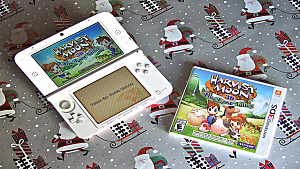 Being a fan of the Harvest Moon franchise since Friends of Mineral Town, and also having involved myself with the actual farm life of raising livestock, I can say that I'm familiar with the scene. While I enjoy the cows mooing and the roosters crowing, sometimes it's easier to put aside your daily chores and pick up a game that doesn't require you to save the world from the evil king or perform some other seemingly unreachable feat. 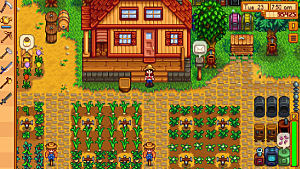 ConcernedApe brings to you an excellent game that is a fresh take on the farming life without the salty sweat and bitter regret. When your first start up the game, you are given the option to customize your character. Everything from their shirt and pants to their gender, hairstyle, hair color/shade, and more can be modified. 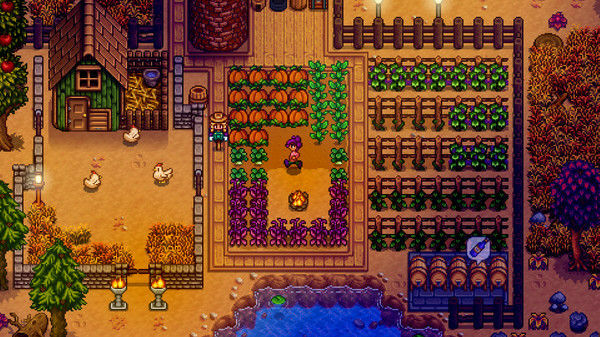 While your little farmer might not seem all that appealing at first, you won't be disappointed when the game finally opens up and you're introduced to a portion of the pixel art that makes up Stardew Valley. To be honest I've never been able to say that a vegetable (or any other plant for that matter) was cute. But the flora in this game, while simplistic, truly made the environment stand out. 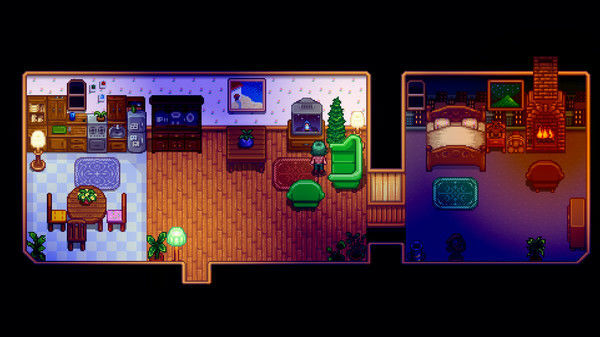 After playing the game for a couple of hours I was almost frustrated with myself for how much I was enjoying Stardew Valley. It's the little things that really captured my attention; such as how the tall grass on your farm moves when you walk through it or how a wild rabbit will occasionally run across the screen and jump into the safety of a nearby bush. Another thing that had me cracking a smile was the actions of the townspeople; or even my own little farmer. They'll perform actions such as the bartender drying out a glass, or as in the case of my farmer, down a healthy helping of salad and rub her stomach to give the impression that it was pretty darn good (or turn green in the face when it's absolutely disgusting). The game practically throws you into the farm life without so much as an explanation of how things work. This can be compared to how your farmer was originally an office worker who desperately needed a change and took up their late grandfather's farm. Obviously not knowing anything about the farm life, it seems appropriate that the game doesn't force you into a lengthy tutorial. Instead it just gives you the basics of how to walk, run and interact with items, people, and animals. 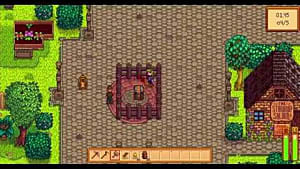 If you were expecting to just raise a few cows and plant a couple of onions, Stardew Valley will shake you to your senses and make sure that you're aware of just how much you can get done. 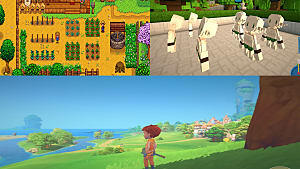 Customizing your home is often the norm for many games in this day and age, but customization is taken a step further by allowing you to craft objects that can be placed around your farm. Craft everything from a scarecrow that'll scare away (demonic beady eyed) crows that'll actually eat your precious crops to fences, paths, and sprinklers that'll water your fields automatically when you've got more plants than you can manage to water in one sitting. 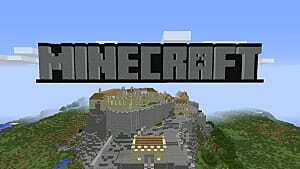 The process of crafting can easily be accessed through the game's menu; where other information can also be found neatly placed under related tabs. You can upgrade your home to include other nice additions such as a kitchen that will allow you to cook up delicious pixel dinners that'll make just about anyone happy. When you finally get caught up in the beauty of crafting everything from A to Z, you'll eventually find yourself needing precious metals that can only be found within the depths of a mine. 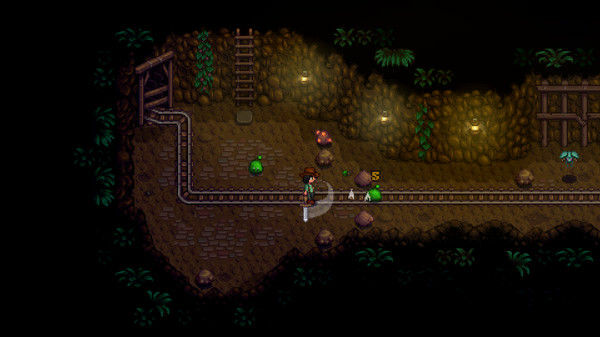 You'll soon find that the mines aren't only inhabited by a couple of rocks and if you aren't careful you'll end up being knocked out by a flying..bug..thing or slime monsters. You're given a rusty old sword and told to be careful and then you're off to the mines to try and figure out if coal is really worth risking your life for. The battle mechanics are incredibly simple, you swing your sword around just as you would do your sickle or fishing rod, with the addition of the ability to guard yourself. Fighting monsters is a addition to the game -- even more so since it is not overly complicated. You slice-and-dice the flying bug creature and you'll get..bug meat. As unappealing as that sounds, at least you won't come out of the battle empty handed. Although not directly related to fighting, the game also has a leveling and quest system. The system isn't what you'd typically expect in terms of leveling. In Stardew Valley, you level up your skills by using certain tools, foraging, etc., which in turn will help you unlock recipes or new items to craft. It's a nice touch and leaves you feeling like you actually accomplished something, and if that wasn't enough there's also achievements that you can unlock. Additionally, if you're terrible with money management in games, Stardew Valley has got you covered with quests that range from finding lost items for townspeople to doing favors which can earn you gold. 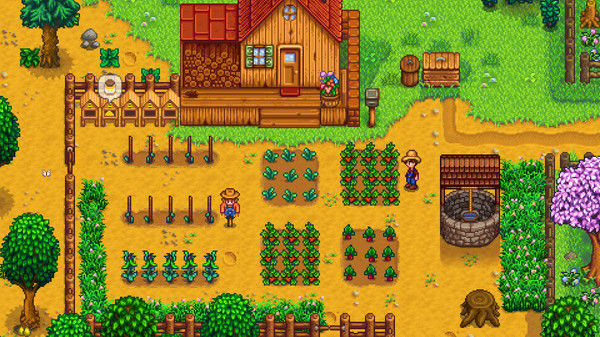 Stardew Valley is a fresh-take on farming games and has plenty of things that Harvest Moon games do not, which makes it safe to say that it isn't just a carbon copy of the latter. 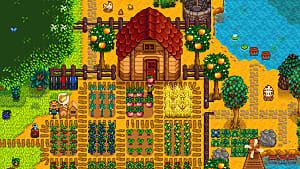 While you're thrown into the game without being taught much about farming, or anything else for that matter, the game is incredibly easy to learn so it's understandable (and appreciated) as to why a lengthy (and probably boring) tutorial was left out. You're able to travel to many different areas within this game. However, everything isn't unlocked from the start. The game forces you to figure out the secrets of Stardew Valley all on your own; a welcome experience as you'll never know what to expect next. There's a believable antagonist in the game, that being the resident Joja Mart that is attempting to force townspeople to buy their products with the aid of coupons and other discounts. I thought it was a nice touch that you can either buy your products from Joja Mart or from the individually owned Pierre's. The festivals make sure to truly involve you beyond something as simple as entering a dish. I've found myself participating in an egg hunt and not even feeling ashamed about it. There's no Harvest Goddess here and you most definitely won't be saving the forest , but there is the presence of spirits that are incredibly mysterious and add to the increasing list of hidden secrets within the game. My complaints regarding Stardew Valley are few and far in between. In order to move any buildings you have set up on your farm they have to be completely demolished first. However, this would be the case in reality so if you look at it from that perspective it might not sound as bad. I do wish that the livestock within the game had genders (outside of the obvious hen or cow) or that the option to sell certain livestock for their meat remained within the game. Nevertheless Stardew Valley is so darn appealing that I can't stay disappointed for long. A lot of work went into this game by its developer and I can say with certainty that there won't be any regret coming from that. The only regret that'll surface from this game is from the people who are reluctant to at least give this game a try. I gave Stardew Valley 10 out of 10 stars for having an environment that feels alive and highly believable. When you grow weary of farming, all you have to do is go hack apart some slime monsters in the mines before coming home to your loyal pet companion and calling it a night. Oh, and the fireplace in your house looks pretty toasty too. Harvest Moon fans and folks who live under rocks alike will find themselves in love with this new indie farming sim. The game has lived up to the hype. I know it will be another indie game people stream on Twitch for a week or two, then quit sadly. This game has a lot of content to offer, along with unlimited play even after the story ends! I definitely agree! 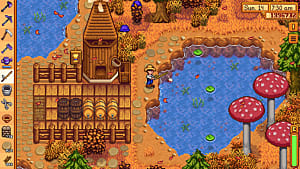 The retro-vibe of Stardew Valley seems to be more welcoming than recent HM games. You can completely see the love and hard work that went into making this game, which is what makes it so appealing. I think I will find it hard going back to Harvest Moon after this. This game reminds me so much of HM Back to Nature/64/FoMT so much it's unreal. So much love was put into it and it's exactly the type of experience people who played those HM games would want.